Me Made May has come to a close and I squeaked in one more make to wear in celebration of May 31st. Since it was cold, gray and rainy on Sunday, I just did a quick inside shot for Instagram and Pinterest. 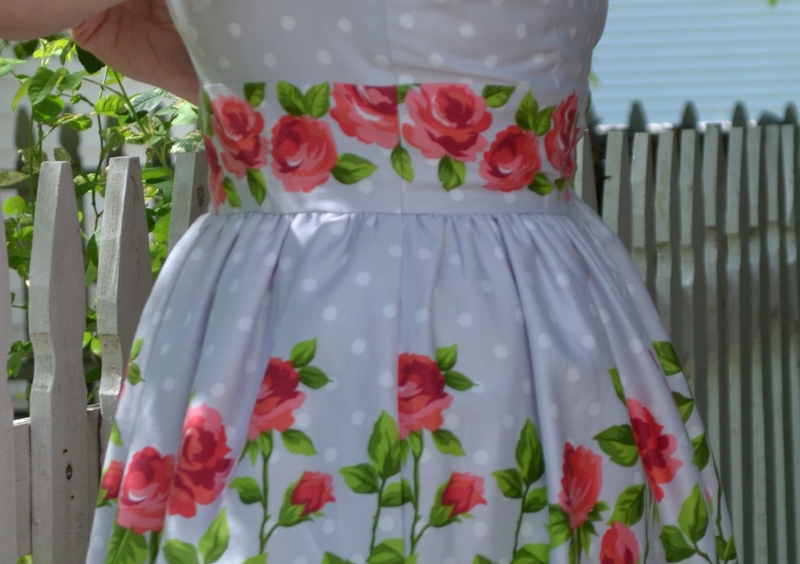 The much nicer weather today was the first opportunity to get out and take better pictures of the rosy dress made with Gertie by Gretchen Hirsch cotton fabric. The border print roses are on a background of soft gray with white polka dots. I love the color. It’s sold at JoAnn Fabrics only, a chain I don’t usually frequent for fabrics, but buy plenty of notions there. I don’t know if it is all their stores or just the one by me, but there is a pretty slim selection of fashion fabric. If it’s fleece you want, they have a ton. 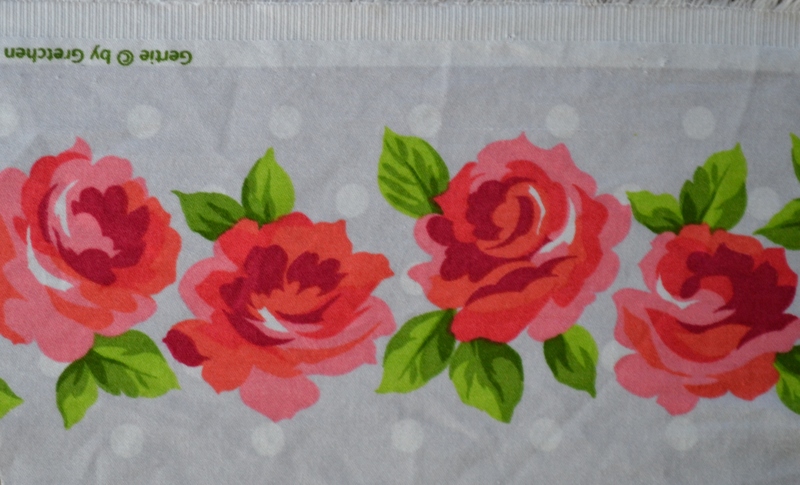 The top border has a line of roses dancing across in a single line, making for some fun options for pattern layout. 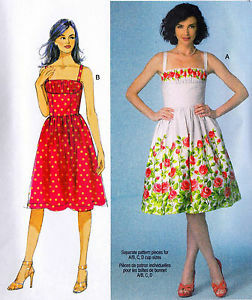 One of the Gertie patterns, Butterick 6167, uses the print with the top border shirred along the upper bust line. The dirdl skirt shows off the lower border in all it’s splendor. I wanted a tad more coverage, but still a sundress look. 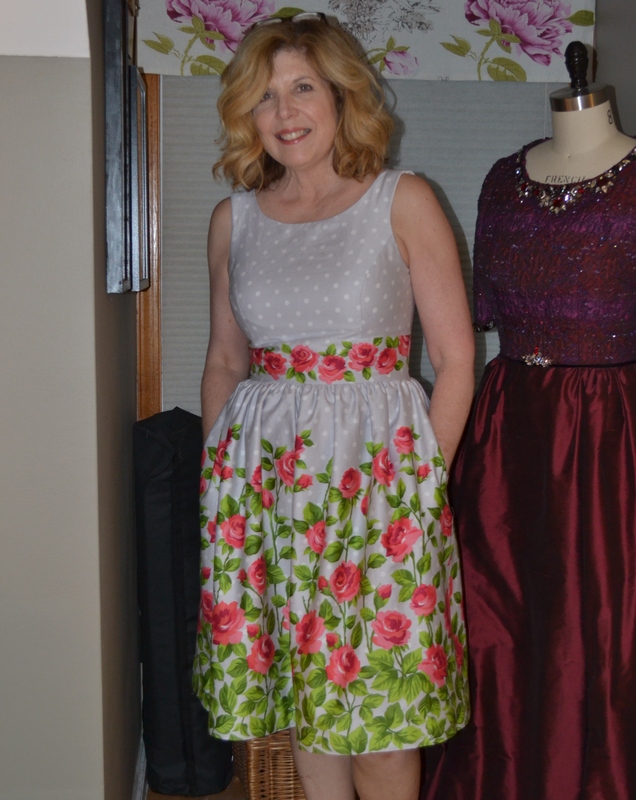 Having made Vogue 8998 before, I could save time on fitting the bodice and just change the skirt. Since a dirdl skirt is just rectangles, I didn’t even use a pattern. I just cut the fabric for the skirt in half, then cut the piece for the back in half again. Having the 3 pieces (one front, two back) allows for pockets in the seams and a back zipper. The waist band has a slight curve to it, which worked with the placement on the line of roses at the top border. 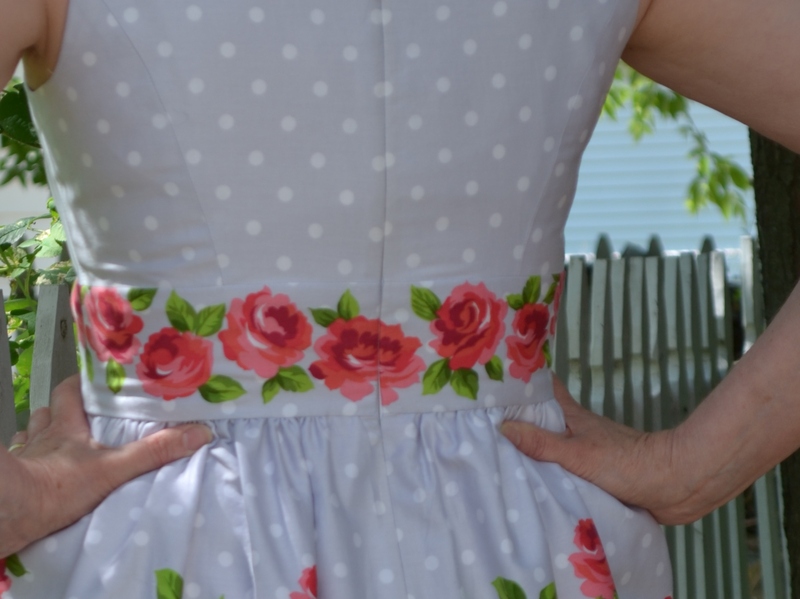 The front waist band was an easy placement. The sides meet on an upswing. Almost got the back to overlap evenly, but not quite. The fabric is soft to the touch and with the soft cotton batiste as the lining, the dress is feels good inside and out. The pattern called for interfacing the entire bodice, but I only interfaced the waistband. I was trying to get some of my neighbor’s roses in the photo. A rosy outlook for the rest of the summer. 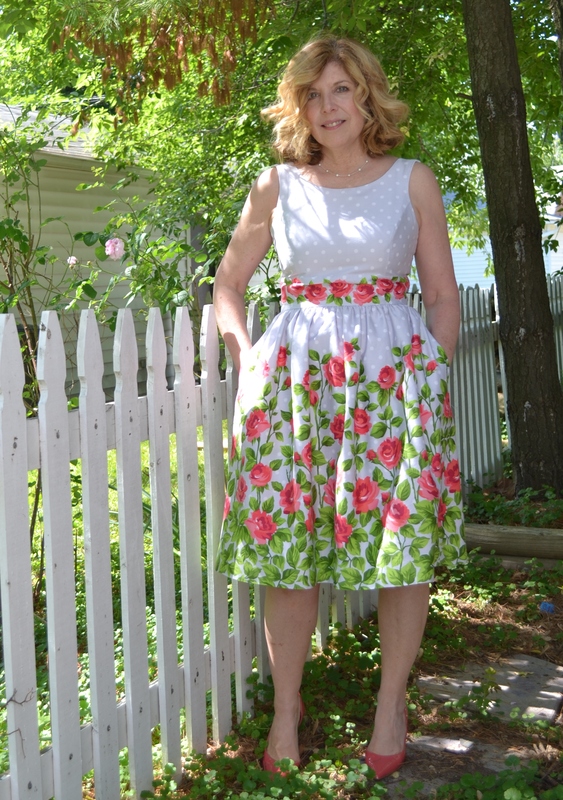 If I had it to do again, I would have bought more fabric and made the skirt a little fuller. Also I would have moved the lower border down, so more of the gray and white dots show and less of the green leaves. Although getting in daily photos can be trying, I will miss seeing everyone’s Me Made May posts, it was something I looked forward to each day. I found so much inspiration and so many more sewers to follow on Instagram. Seeing the kindred spirits posting from around the world was the best part. 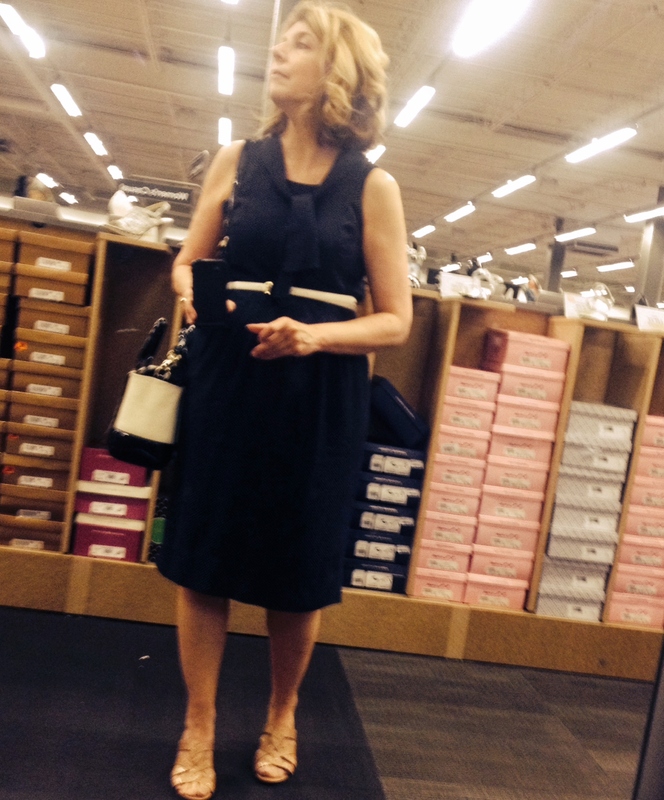 Day 25 – Shoe shopping in a mash up dress of Vogue Patterns 8998 and 8413 in a navy and white polka dot rayon blend. 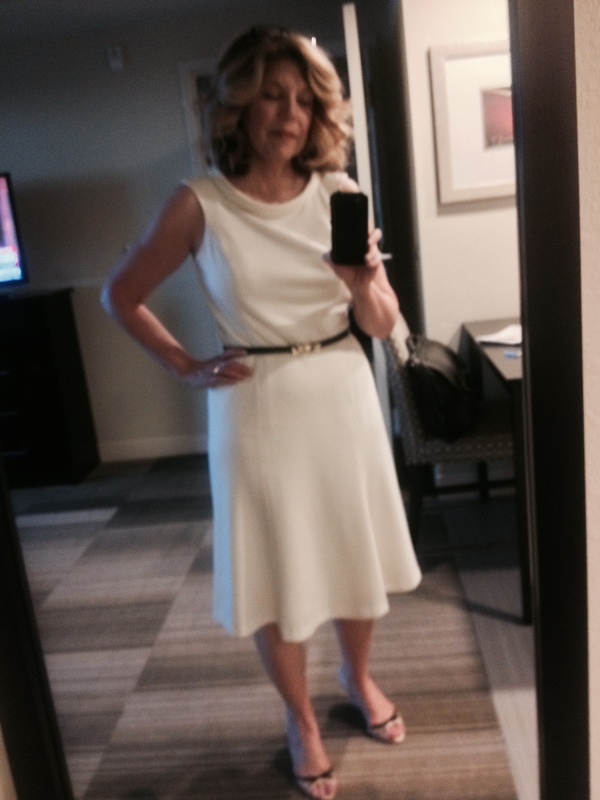 Day 26 – Dress from Vogue Patterns 8972 in honeysuckle cotton mataelasse. 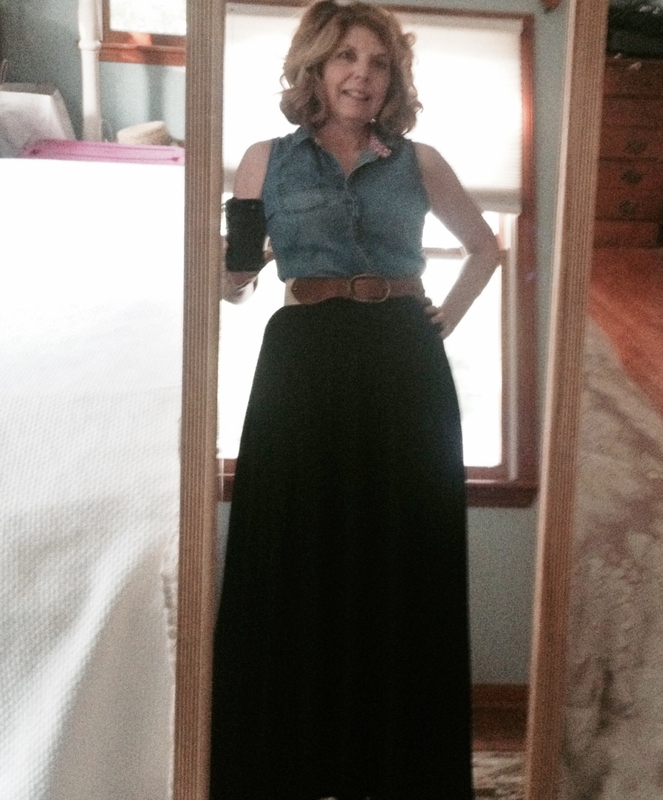 Day 27 – Black knit maxi skirt was the lining of a disaster dress. Threw the dress away and made the lining into a skirt. Day 28 – Not much left in the closet. 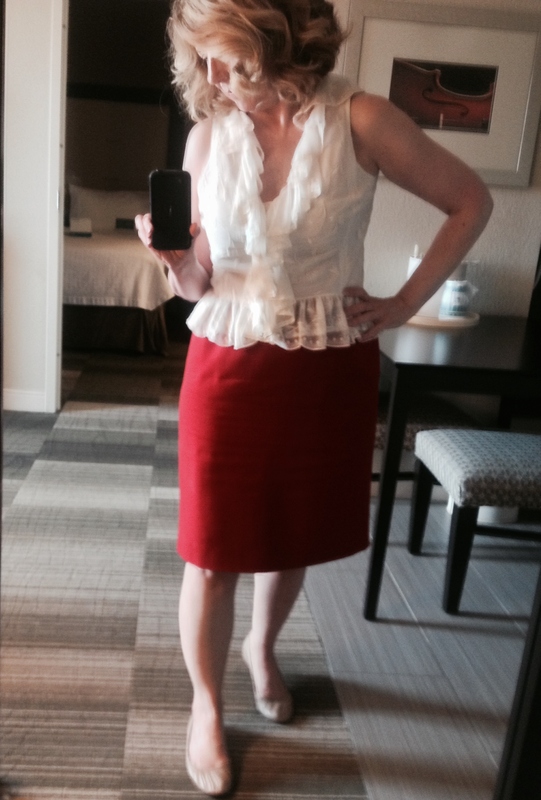 A pencil skirt from Butterick 5466 in Ralph Lauren twill from Mood. 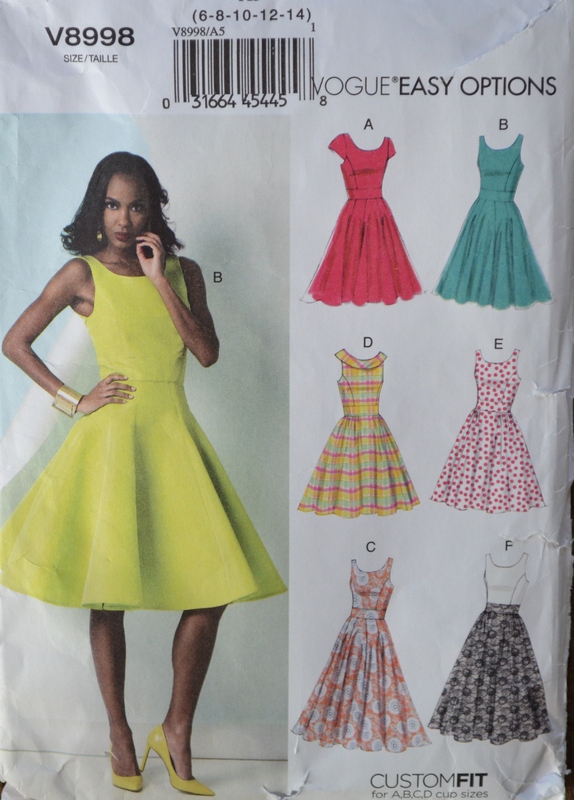 Day 29 – Dress made by combining skirt pattern Butterick 4136 with bodice from dress pattern Vogue 8413. Narrow collar due to not enough of the Sophia knit fabric from Vogue Fabrics. 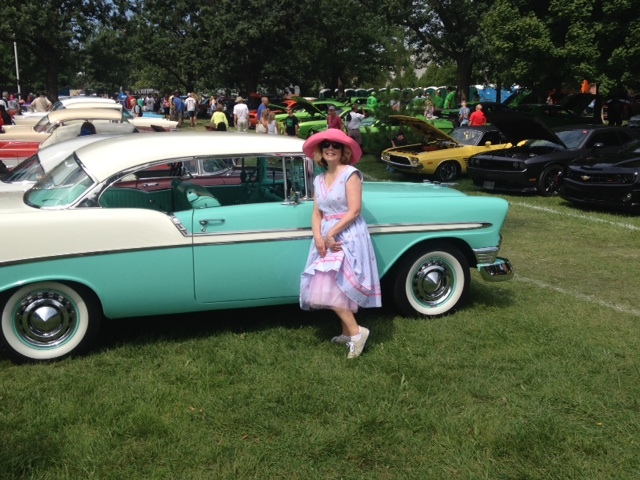 Day 30 – Dress made last year for the Woodward Dream Cruise. Vintage 1957 reissue of Vogue Patterns 8789 in blue and white seersucker with embroidered cherries. Added petersham ribbon to make it look like a border print. Loved that belt kit. Day 30 dress last year with a car from the same year. Not sure why we thought it was a good idea to show the petticoat? For those not familiar with the cruise, it’s all about cars, not a boat in sight. Day 31 – Blogged above. The indoor, rainy day photo. This was my first Me Made May and it was fun to be a part of something which has grown so widespread. It makes one feel much less alone in a world of non-sewers, who are not constantly thinking about patterns, fabric and planning what to make next. I wish you all lived in my neighborhood. Thank you Zo. See you next year, same time, same place. Very impressive month for sure! Your rose dress is lovely and so cheery. Thank you, I didn’t intend to get through the month without repeating, but did. Guess I’ve sewn more than I expected. There are a few other Gertie prints I like, but trying to keep my stash to a reasonable level. 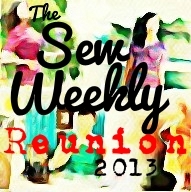 New to stitching (well, returning after long absence) and new to blogging. Plan to join in next year. Your Me Made wardrobe is lovely, especially the roses! Thank you! Yes, I’m learning great tips already and seeing just how wonderful this community is. Anxious to be an active part of it all. 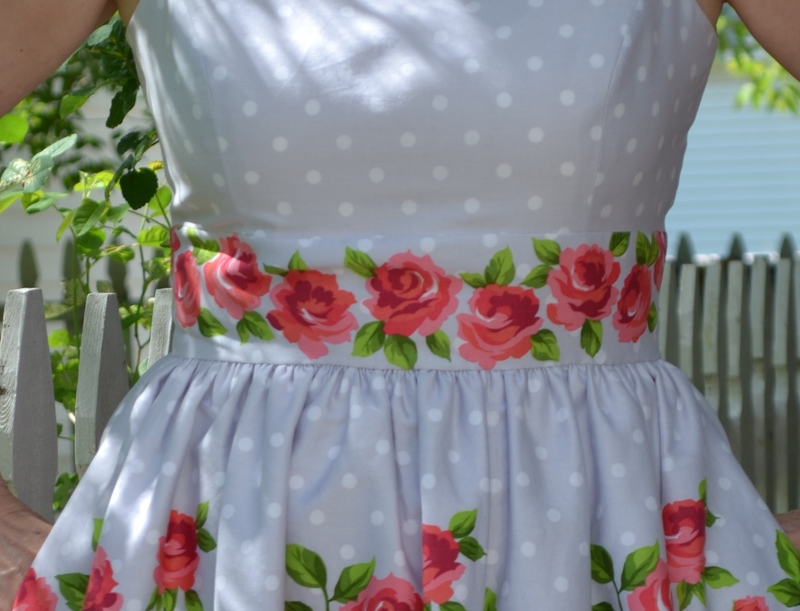 Great pattern selection for the roses dress; it looks fabulous on you. I don’t frequent JoAnns for fabrics either but once in a while there is something good. The rest of your creations for May are wonderful. Thanks for sharing all the pics. Thanks, I’m always a little suspect of the quality at JoAnns, but so far this seems to wash well. I’m so glad not to be taking daily pictures, but I sure miss seeing everyone else’s photos. Ha, Ha, I actually do wear dresses and skirts just hanging around the house. I know the neighbors think it’s weird when I do yard work in a skirt. I just don’t bend over too far, no flashing here. Beautiful use of that border print! Thanks, I do love border prints. I want to find one I can turn sideways. I have enjoyed seeing your outfits for MMMay. What a lovely collection of dresses you have, and they all suit you perfectly. I really love your honeysuckle pique dress. I’m going to have to look at that pattern. And the roses…. love roses! It’s a beautiful, cheery dress. 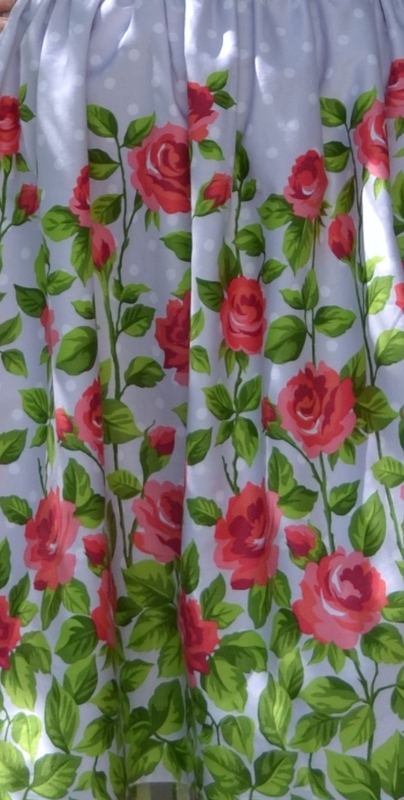 I think my all time favourite rose fabric is Liberty’s Carline. I think I bought it in every available colourway about a decade ago. Thank you. I looked up the Liberty Carline, it’s beautiful. My favorite was with a navy background. The one good fabric store by me only stocks a few Liberty prints, but I just ordered a piece from Mood. Not roses, but a floral in a pretty, subtle gray and white. I’ve really loved seeing everybody’s MMM creations. And that dress is very lovely, it looks so good on you! Thanks, I really missing seeing all the daily postings now that it’s over. Oh this is beautiful! I love how you have placed the roses! Gorgeous! Thank you, I think Gretchen knew what she was doing when she designed the fabric. It was fun to play with. You’ve got lots of lovely Me Made’s there! I love your flowered border print dress. Thank you. It was fun to be part of the sharing. There are so many sewers out there challenging themselves and doing lovely work.